Behind the Bit: I can dream, can't I? Heather Blitz has now endorsed Samshield Helmets -- actually their one of her sponsors -- and I went to their Web site to check out their wares. OMGoodness., these helmets are so cool, and there is an online tool (the "configurator") that lets you create a custom helmet with all sorts of options. Take a look at http://www.samshield.com/. Expensive helmets blow my mind. If I fall off, I still have to replace them. I'd rather re-spend the $40 then $$$. I saw those in the Dover catalog. They ARE really cool, but I remain simply astounded at how much money one can spend on a helmet, given there are perfectly safe models available for about 30 bucks! I for one am glad there are super fancy, trendy helmets. 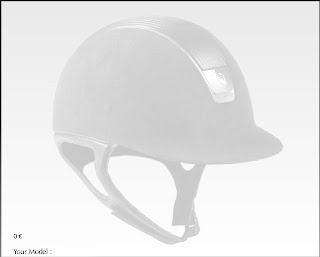 Since so much of the horse world/dressage world is driven by fashion/bling/trends, I'm all for having helmets become the next "trendy" status symbol, since that means more protected heads. The presence of high-end helmets means that helmets are becoming the new "it" item--a good thing. Yup,I will dream too! My helmet I want is 1195.43! Shew! I like LAS better, personally. Unfortunately, when I tried one on at my local tack shop, I found it unbelievably uncomfortable. I love love love my samshield. Their basic model is priced similarly to the charles owens, and they are the only helmet I've found that fits my pointy round head and doesn't make it look like a mushroom cap. I can also -feel- the wind against my hair when I wear it, incredible ventilation. I only wish I could afford their more expensive models... But it's just not in the cards right now. Maybe someday.